From the front lines of youth activism, Dallas Jessup (17) delivers a how-to-guide for any teen who wants to change the world. She shares inspiring stories of 10 high-impact teens and her own community service project which grew into a million-girl worldwide revolution against predators. Nonprofit success tips from heroic teens for the next generation of heroes. 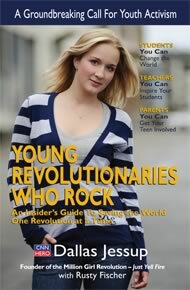 A must-read for any teen wanting a roadmap to launch their own amazing cool and effective non-profit. Good Morning America "Absolutely Amazing"